Auction #359S - Transitional Design Online Auction Broadview Hts. 81 Fiat Conv. 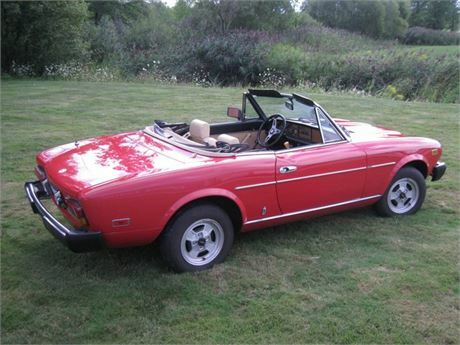 This Auction is for a nice low mileage 1981 Fiat 2000 Spider Convertible. Original 1 owner car with less than 52,000 miles. This rust-free car has never seen winters, never been hit/damaged and has all of its original paint. Well documented from new with a copy of the original window sticker, brochures, owner’s manual, warranty book and service records. There is something to be said for originality - Don’t miss out! This is a car you can just hop in and drive! If you would like to see the car, please contact Len @ 440-832-0909 to arrange a time.